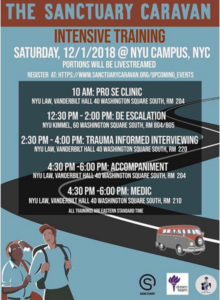 The New Sanctuary Coalition is offering intensive trainings tomorrow, December 1, both in person in New York City and via livestream to support the Sanctuary Caravan. “We regard this Exodus and the Caravan we are building to meet the Exodus as an act of nonviolent resistance against morally abhorrent laws which infringe upon the rights of human beings to better the lives of their children and families. We believe the imprisonment, deportation and mistreatment of people, because of where they were born, to be the greatest moral crisis of our time. We condemn in the strongest possible terms the violence of Mexican and U.S. authorities waged and threatened against this movement of people engaged in self-liberation. The violence they are fleeing has been inherited from U.S. imperialism, and the political pressure the U.S. places upon Mexico to treat the Exodus with violence constitutes colonialism. Restrictions on migration have ruined and ended too many lives. Join us, even if you’re not able to travel to the border. For details and to RSVP, visit: https://www.sanctuarycaravan.org/upcoming_events. I’m very excited to be leading a workshop as part of The Millay Colony’s Sanctuary Series in June. DISENTANGLING– Disaster Has Come from the Outside. Don’t Give Up Hope. How do we stay grounded and reduce anxiety in the face of overwhelm? Join us as we disentangle ourselves from disorder and gain the capacity to welcome the unexpected. Through guided meditations and writing exercises we will explore the present moment in order to gain focus and effectiveness. We will develop (resistance) strategies of self-care and cultivate awareness of our interdependence using writing as our vehicle. We will explore the nexus between acceptance and resistance, complacency and direct action: the places where opposing impulses connect, investigating ways to successfully integrate these forces through our writing and in our bodies. The Sanctuary Series of workshops brings together artists, healers and educators in collaborative sessions that ask participants to creatively imagine desired cultural and community outcomes as well as their role within those outcomes. Held in New York City, Hudson and other locations, these are 2-3 hour workshops centered on writing or visual art-making. To Apply: Send a letter of introduction including a brief biography with a $25 deposit. Send materials requested to Caroline Crumpacker at director@millaycolony.org. Send deposit via PayPal using our DONATE Button. Or hard copy can go to The Millay Colony for the Arts, 454 East Hill Road, Austerlitz, NY. Attention: Workshops. Make checks payable to The Millay Colony for the Arts. Fee: Each workshop in The Sanctuary Series costs $60 or $125 for all three. Millay Colony Alumni receive a 15% discount. 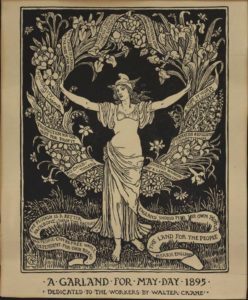 Millay Colony shares some post-workshop reflections from participant Carol Mirakove.